Save 20% by buying all 4 sun essentials! Chamomile & Calendula Sun Cream 120ml – When planning a day in the sun, a mineral based sun protection cream is a must. 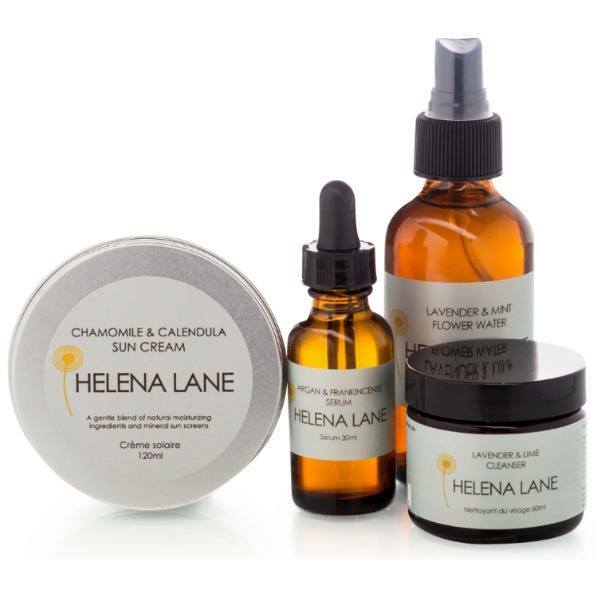 My natural, gentle and effective zinc based sun cream will reflect away UVA and UVB rays to keep the skin safe. Lavender & Lime Cleanser 60ml – Oil cleansing at the end of the day helps to keep oil balance in check and keeps our skin’s own protective layers intact. You will love the refreshing and uplifting scents of lavender, lime and eucalyptus. Lavender & Mint Flower Water 120ml – A must have on hot sunny days! Lavender hydrosol and mint essential oils cool, refresh and heal sun parched skin. Spray this liberally all day, everywhere, including your friends! Makes an excellent after-sun spray for the whole body. Argan & Frankincense Serum 30ml – Deeply repairing and replenishing after a day in the sun, yet light and easily absorbed. In the summer I use this as my evening post cleansing treatment as well as my morning moisturizer. Please note that my products have not been evaluated by Health Canada and therefore cannot be assigned an SPF rating. The percentage of zinc oxide combined with the natural UV filters of the base ingredients can give protection comparable to SPF 30. However all skin is different and can tolerate different amounts of sun. When using my sun creams please be vigilant in reapplying regularly, especially after being in the water or sweating. These formulations have been tested on adult and child volunteers for many summers with great success, I’m confident you will love them too. Apply generously and regularly prior to sun exposure and repeat after contact with water.As all skin reacts differently in the sun I recommend reapplying every 40 minutes when first using this sun cream, you can then adjust the timing depending on your skin. Take a pea sized amount and massage into a warm damp face. Leave for 2-20 minutes (can be used as a mask). Remove with a warm damp cloth. If you are removing lots of dirt or make-up you may need to repeat. Follow with floral water and serum, or leave your skin as is. Warm a couple of drops of serum between fingertips and pat gently onto damp face and neck. Use under your moisturizer day or night or on its own after your flower water.